Hear a discussion with three of our six ACE award winners in a podcast of our monthly Spotlight on Arts & Culture interview show. Hear how Dennis Bradbury (Citizen), Megan Bonneau McCool (Artist) and Jim Royle (Educator) got started and what drives them forward in their dynamic impact on their communities. Click here. The Cultural Alliance is a co-sponsor of Create The Vote CT, a nonpartisan public education campaign to raise awareness about the impact of the arts and culture among voters and candidates running for public office. 12 of our Organizational Members have also signed up as co-sponsors, promising to help spread the word about the campaign. As individuals you can sign-up to the mailing list for the latest news, like and follow the campaign on Twitter and Facebook, sharing the news with the hashtag #CreateTheVoteCT! See the questionnaire just delivered to candidates asking about their positions on the impact of the arts and culture on our communities. SAVORCITY, the monthly tour of Bridgeport restaurants, food, art, and music, packed 50 people into Bereket Turkish Cuisine in Black Rock the night of May 23rd. Paintings by Susan Murray and music by John Torres entertained the crowd as Bereket brought out a stunning array of appetizers and a mixed grill main course. The next stop on the tour is Tues June 19, 6-9pm at 'A Vucchella on Fairfield Avenue, downtown Bridgeport, just 2 days before Make Music Day, Bridgeport. Music by Uma Lou Trio and paintings by Liz Squillace. Reserve your seat here! 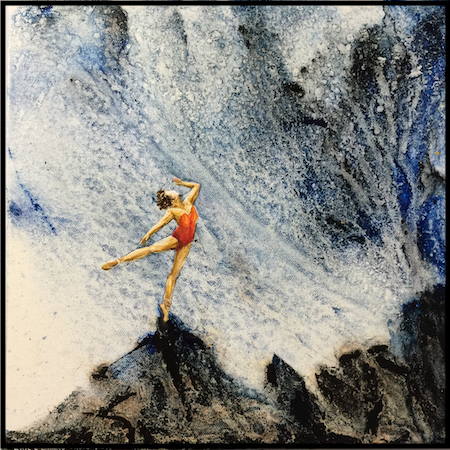 Suzanne Benton has shared her multi-faceted artwork for 60 years and in 32 countries. A printmaker, painter, metal sculptor, mask maker/performance artist, lecturer, and workshop leader, she believes the purpose of art is to explore humanity, and that art comes alive when it clearly touches people’s lives. She is drawn to multicul­tural themes, steeped in myth, ritual, and archetype, and, bridging cultures, has created and shared her artwork throughout the world - having worked and exhibited from New York City to villages in remote parts of Africa, India, and Nepal, as well as philosophy and education portals from Calcutta to Cambridge. Suzanne has had over 150 solo exhibitions and representation in museums and worldwide private collections. Numerous grants and fellowships include a Fulbright to India, and artist residencies in the U. S. and abroad, oftentimes hosted by the cultural arm of U.S. embassies. She’s the author of The Art of Welded Sculpture and numerous articles, and listed in Who’s Who in America, Who’s Who in American Art, and Feminists Who Changed America, 1963-1975. 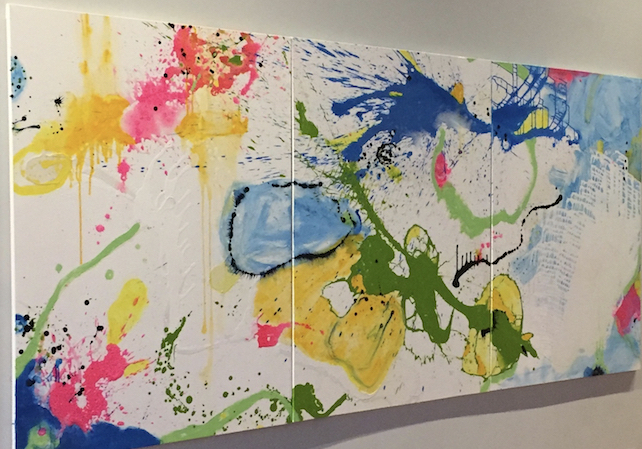 A journeying artist, but long based in Ridgefield, she says she seeks "to filter the treasures of newness, of sharing, spectacle, friendship and insight into my artwork." Suzanne is currently writing Spirit of Hope, a memoir on her art and life. See below for details of her Open House Day showcase June 9. See Suzanne's website, and Facebook page. Peter Mendelson is a Weston-based photographer, whose work embodies photography’s potential to “elevate the ordinary” and present new ways of seeing the world. Growing up a suburban kid on the North Shore of Long Island in the 1970s, Peter’s two great escapes were New York City, and the Long Island shoreline from Jones Beach to Montauk. While radically different, these urban and coastal environments expanded his horizons, literally and figuratively, and have had a psychological pull on him that lasts to this day. Peter uses perspective, light, color and form to capture the psychological power of these spaces in photographs to transport viewers into these and other environments and inspire them to re-imagine the world for themselves. Whether taken during his visit to the Neon Boneyard in Las Vegas, his explorations of Miami Beach and the Maine coast, or even during commutes to and from New York City, his photographs focus on those things that are often overlooked or abandoned, but which reward their viewers when given a second, deeper look. Peter’s work can be seen in exhibits and galleries in New York, Connecticut, Rhode Island and Massachusetts. See Peter's website, and Facebook and Instagram pages. Michael Brennecke, Heidi Lewis Coleman, Rhonda Gentry, Ellen Gould, Mary Harold, Karen Kalkstein, Melissa Orme, Diane Pollack, Barbara Ringer, and Nancy Woodward all have work juried in to The Ridgefield Guild of Art's Annual Juried Member Show, opening Sat. June 2, 4-6pm. Susan Powell of Susan Powell Fine Art, Madison, selected 81 pieces in a variety of media, from 176 submissions, to be part of the show. Tara Blackwell, Alicia Cobb, Ellen Gordon, Mindy Green, Elizabeth Howard, Karen Kent, Katya Lebrija, Dayan Moore, Sooo-z Mastropietro, Steve Parton, and Diane Pollack are 11 of the 26 artists participating in Beechwood Arts & Innovation's Spring Arts Immersion Salon, Fired Up! on Sat. June 2, 8-11pm. Artists are interpreting both sides of being "fired up," often in collaboration with each other. Tickets still available. Click image for promo video. 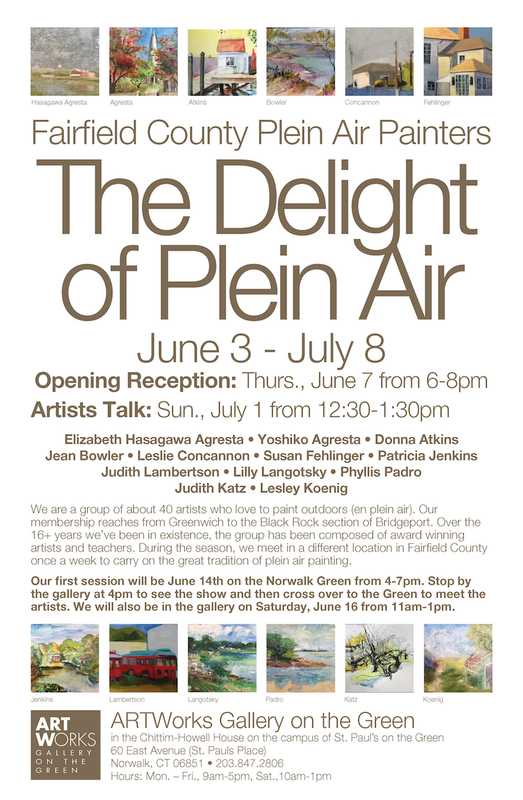 Elizabeth Hasagawa Agresta, Susan Fehlinger and Lesley Koening are Cultural Alliance members who are participating in The Delight of Plein Air, an exhibition of the work of 12 of the 40 members of the Fairfield County Plein Air Painters at the ARTWorks Gallery at St. Paul's on the Green. Click image at right for a flyer of the show, which opens with a reception Thurs. June 7, 6-8pm. An Artists Talk takes place Sun. July 1, 12:30-1pm. Tom Berntsen, Louise Cadoux, Karen Kalkstein, Marjorie Poe, and Guy Sealy are Cultural Alliance members showing in the next in The Westport Artists Collective Pop Up exhibition, opening Wed. June 6, 6-8pm at the Westport Arts Center. The Pop Up will be on view through Sat. June 9, when there will be an artists talk at 3pm. 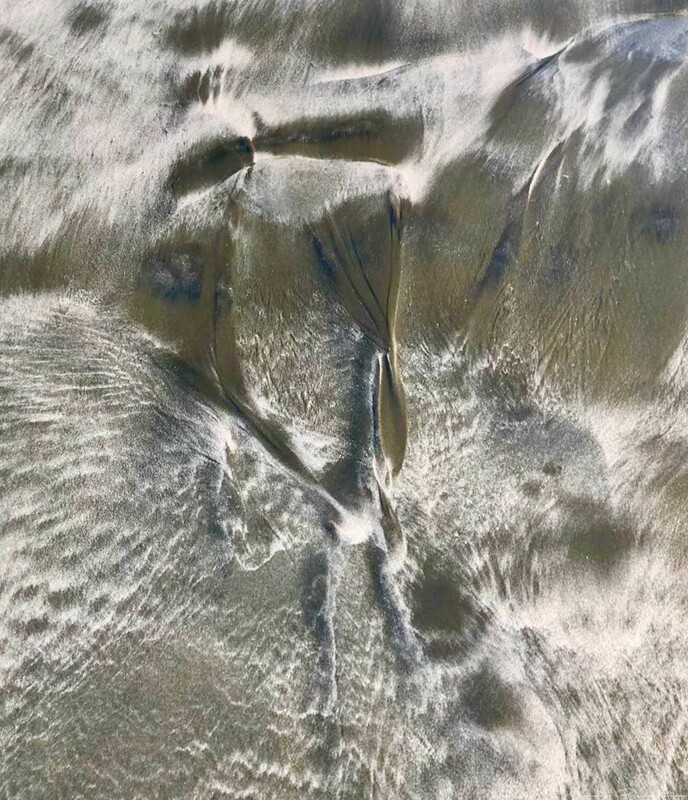 Anna Badini has a solo show, In Other Worlds, opening at the Loft Artists Association with a reception, Fri June 8, 6-9pm, and continuing through July 8. Born in Africa, raised in Italy and American since her teens, Badini has traveled the world and, as a result of her experiences, she says, "the environment of the universe has become an eternal source of inspiration and reminiscence, as well as providing emotional, psychological and spiritual significance." Most of her work is unconscious and dictated with strong representation and bold color. "My first impression of skyscrapers when I landed in NYC never left me and merged with other perceptions along the way," she says. In a similar vein, for many years, she sought to seek and to find in her work as a psychotherapist and now as an artist, she similarly seeks to discover and reveal parts of herself with her painting. Badini’s hope is that her work will do the same for her viewers. New member Suzanne Benton opens her Art Showcase at 22 Donnelly Drive, Ridgefield, for the tenth year, on Connecticut's Open House Day on Sat. June 9, 1-4pm. Besides seeing her latest works from her recent residency at Eckerd College, St Petersburg, FL, visitors will be intrigued by a panoply of Portrait Boxes, metal sculpture, masks, paintings, and more in the informal setting in this prize-winning artist’s home/studio. Visitors are invited to circle the grounds and see bronze and Cor-ten steel garden sculpture bringing a new face to her years as a metal sculptor. Suzanne will also be at the piano with Beethoven, Chopin, Debussy, and Satie. You’ll be welcomed to join the conversation and spirit of this stellar event. Andrea Bonfils, whose solo exhibition Botanical Refraction, at Isabella Garrucho Fine Art, presents captivating imagery from her underwater photography series Submerged Garden, is welcoming designers and collectors to the gallery Weds. June 6, 1-7pm to discuss custom commissions and work available for large scale settings. Isabella Garrucho and Alex Trimper will also be in attendance. At right, Andrea's photo collage, White Band Sky (detail). Congratulations to Nancy Breakstone, who was accepted as a new member of the Silvermine Guild of Artists on May 20th. 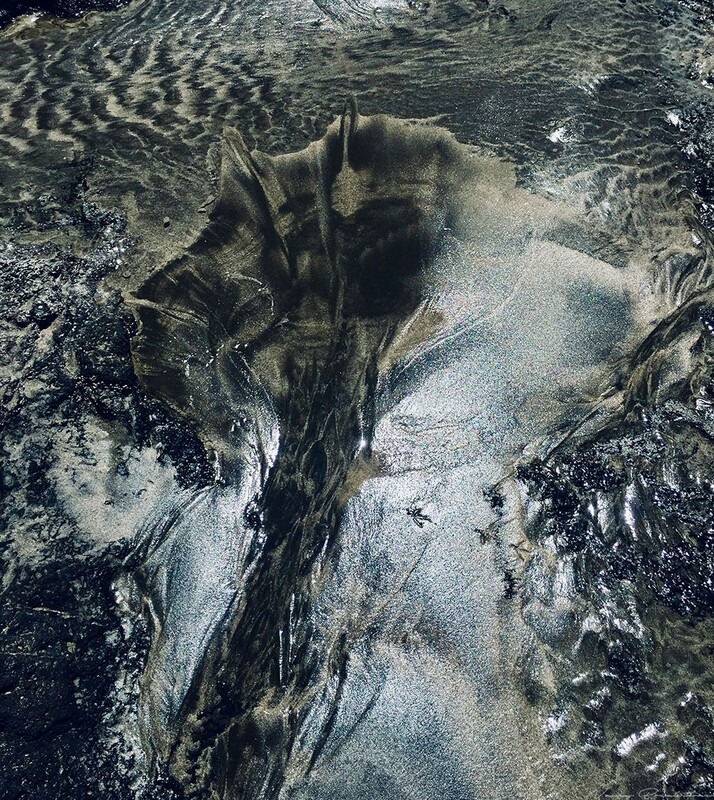 Her photograph Flow and Light In The Sand (digital, 28x30, at right, click for larger image) is one of her two being shown at the CCNS Art Show, May 31-June 2. Nancy is also showing Phoenix at the Maritime Garage Gallery's Reverence for Nature show, opening Wed. June 13, 5-7pm. Eric Chiang is showing two works in the Maritime Garage Gallery's show, A Reverence for Nature, that opens with a reception Wed. June 13, 5-7pm at the Norwalk Maritime Garage Gallery. The show runs through Sept. 28. 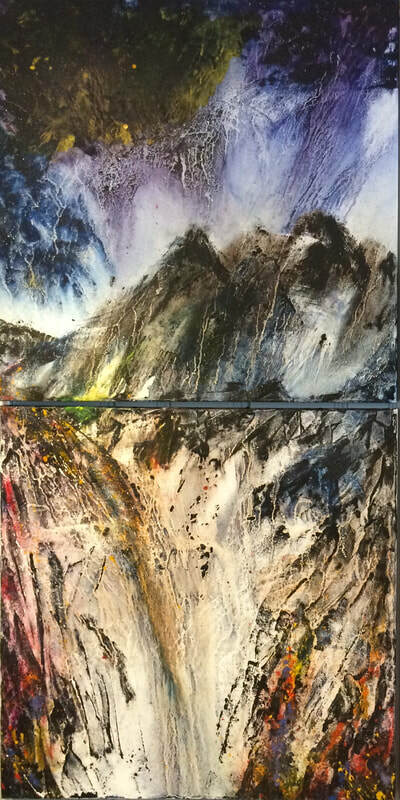 Eric is showing Ode to Life 1 (2018, oil on 2 canvases, 72x36) in which, he says, life (represented by colorful dots) thrive in beautiful, yet tempestuous and often hostile natural environments. Also, Ode to Nature (2017, oil on canvas, 12x12, one of 9 panels, at right; click for complete piece) that shows a graceful response to nature that is beautiful, yet also tempestuous. Heidi Lewis Coleman is exhibiting her Dragonfly Mandala 2 (2016, mixed media assemblage on canvas, 36x36, at right; click for larger image) in the Maritime Garage Gallery's show, A Reverence for Nature, curated by Nadia Martinez, and opening with a reception Wed. June 13, 5-7pm. The show runs through Sept. 28. Heidi also has work in the Ridgefield Guild of Artists Juried member show, opening Sat. June 2, 4-6pm. Rosa Colón has had a particularly busy month. She had 33 pieces in the Greenwich Arts Council's Art to the Avenue, exhibiting in the offices of Shipman and Goodwin. She then had a piece accepted for the Stamford Art Association's 19th Annual Stanley and Vivian Reed Marine Show, one piece exhibited at the Ferguson Library's Memory of Stories show, and two pieces exhibited at The Barlett Arboretum. Now she has had The Line (2017, mixed media, 14x11, detail at right; click for complete image) accepted into the Maritime Garage Gallery's A Reverence for Nature, opening June 13, 5-7pm. Rosa comments that the work was inspired by a mountain peak in the Andes called "La Linea," which gives incredible views when the mist burns off on a sunny day. Carol Nipomnich Dixon has had her mixed media embroidered collage Tune Upon a Blue Guitar, (2009, 21” square framed), juried into Cut Pieces collage exhibition at Emerge Gallery, 228 Main Street, Saugerties, NY. The show runs from June 2 - July 2, 1018, with a reception scheduled for Sat. June 2, 5-8pm. 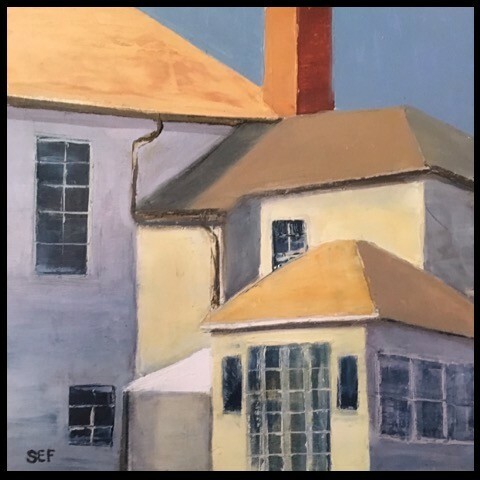 Susan Fehlinger is one of the 12 painters exhibiting in The Delight of Plein Air, at the ARTWorks Gallery at St. Paul's on the Green, opening with a reception Thurs. June 7, 6-8pm. At right, her Back of the House, (oil on canvas, 14x14; click for larger image). 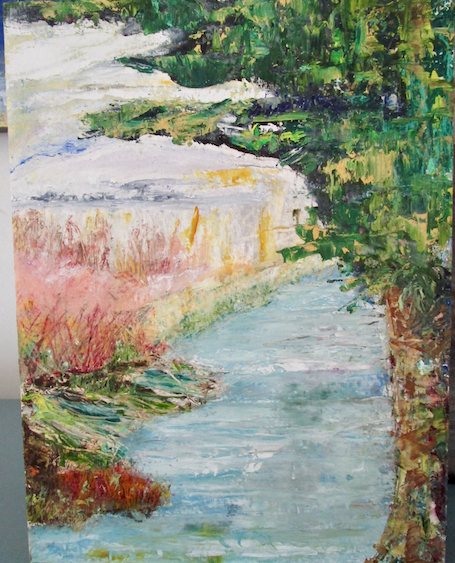 This, Susan says, was painted en plein aire and completed in one day. 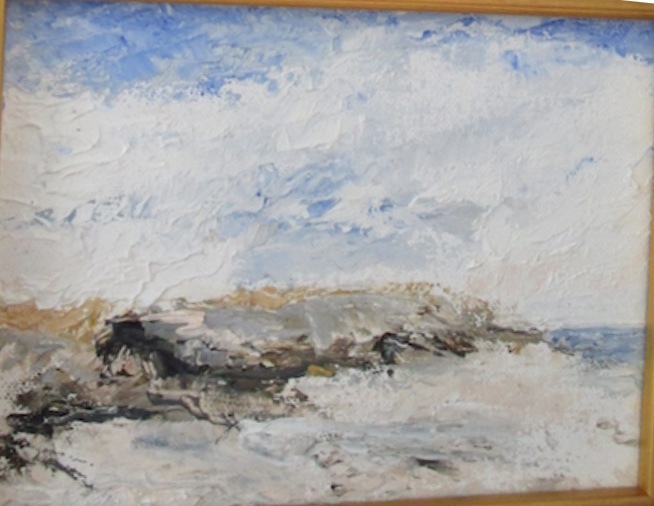 The painting shows the rear of a rather grand home near the sound in St. Mary’s by the Sea in Black Rock. Ellen Gordon has her painting Anticipation (2018, watercolor and ink, 31x41, detail at right, click for complete image) included in the Beechwood Art & Innovation's Fired Up! gallery show as part of the salon the evening of Sat. June 2. She comments that the work "speaks to women’s personal desire and sexuality, regardless of age." Demand Poet Elizabeth Howard is actively participating in Beechwood Art & Innovation's Fired Up! arts immersion salon the evening of Sat. June 2. As visual artists will be collaborating and interpreting the many facets of the term "Fired Up," Elizabeth is partnering with them creating poetry to accompany the visuals. Karen Kalkstein has several pieces in the Westport Artists Collective Pop Up show, opening Wed. June 6, 6-8pm at the Westport Arts Center. Included is Woodlands #1 (2018, mixed media collage on panel, birch bark, wasp nest paper, and feathers, 22x15). She also has several of these pieces in the Ridgefield Guild of Artists, Juried Member Show, opening with a reception Sat. June 2, 4-6pm. 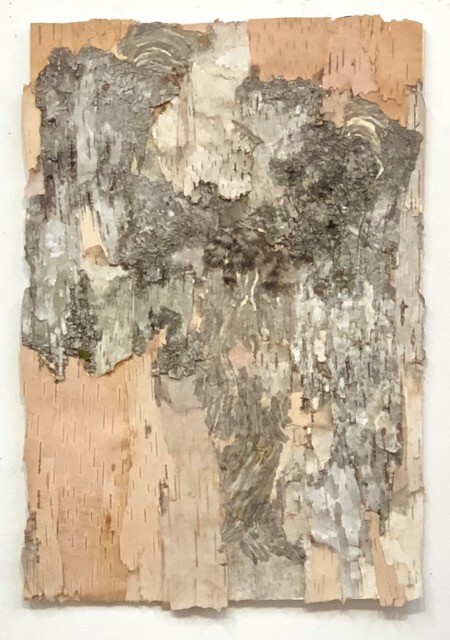 Karen comments: "For several years now, in Vermont, I’ve been collecting pieces of shed birch bark and started using them in my collage work. They proved so varied and enticing that I made whole collages of only the bark. There was an old wasp nest that had been on my work table and soon layers of that nest found their way into the collages. The lines in the wasp paper added a linear element like drawing. Other materials like feathers, little stones, torn bits of old work and newspapers became elements that I could “paint” with. Voila, my bark “paintings”. Lesley Koenig has several pieces in The Delight of Plein Air, opening Thurs. June 7 at ARTWorks Gallery, St Paul's on the Green, including Waves at Montauk (2016, oil on canvas, 6x8): "a palette knife impression on a hot day when the blazing sun seems to blur together all the colors before your eyes." Lesley also has The Nature of Things (2018, oil on paper mounted on birch panel, 11x14), completed in Dmitri Wright's workshop at Silvermine, in the Silvermine School of Art's 28th Annual Student Exhibition, opening Mon. June 4, and running through Sat. June 30, 11am - 5pm. This, Lesley comments, is an abstract landscape in which the tree seems to be simultaneously advancing and receding, reminding her of the ebb and flow of nature. Lastly, she has Memories of Spring I-III (2017, mixed media on canvas triptych, 48x108, detail above;, click for complete image) on view at Synergy, a group show at Blends Gallery, Bridgeport, celebrating the Bridgeport Arts and Culture Council. 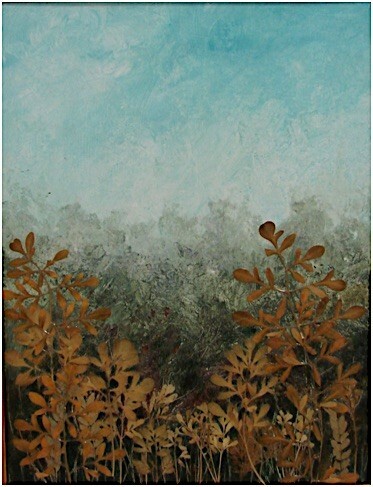 This work she feels "depicts the fleeting impressions one recalls when thinking about seasons past." Joanie Landau had her piece Guancaste 2 juried into the Maritime Garage Gallery exhibit A Reverence for Nature, opening Wed. June 13. Joanie comments that the work symbolizes renewal, birth and hope in a world that is in the midst of dark times. "I felt a change in my own spirit once the Northeast doldrums lifted slightly and the daylight hours got longer, imagining flowers blooming out of my own body. Inspired by a quote from the Brave Girls Club, 'If you can’t find any roses to stop and smell, then paint some, sew some, dream some up…there is always a way to find what we are seeking.'" 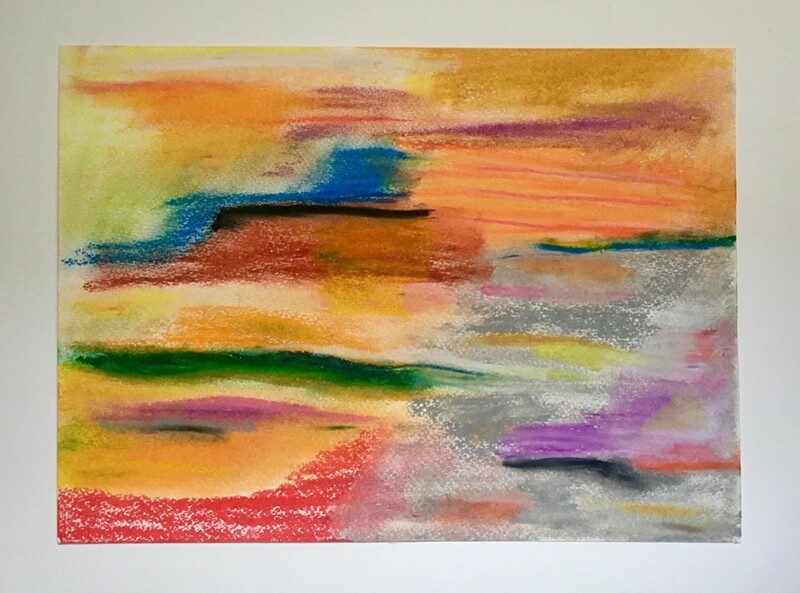 Julia-Rose Liptak had her abstract pastel titled, Desert Dreams(2018, oil pastel on paper, 11x14, detail at right; click for complete image) accepted into the Maritime Garage Gallery exhibit A Reverence for Nature, opening Wed. June 13. Julia comments that her work is Southwest inspired -- influenced by light, landscape, and natural energy. Connie Manna’s solo exhibit Growing up Bronx at the Harrison Public Library (2 Bruce Avenue, Harrison, NY), is inspired by her recollections of her Bronx childhood. She says that as many of the places in her paintings no longer exist, such as the Third Ave. El, and the old-school Throgs Neck Bridge, she relies on her memories, as well as various and assorted ephemera to create her ever-growing homage to the borough of her childhood. The show is up June 4-29 (Mon.-Sat. ), with an artist's reception Sat June 9, 2-4pm. Amy Oestreicher will have her play Factory Treasure read by The Brooklyn-based theatre company, Play Readings With Friends on June 5, and the play will be performed as part of the NYC Short Play Fest June 14-17 Click for discount code. Amy was also nominated for an Audie Award, thanks to Nevertheless She Persisted. Rick Reyes, singer, songwriter and lead for the Cosmic Jibaros, will be the MC for the culminating festivities of Make Music Day-Bridgeport, June 21, to broadcast live on WPKN, 89.5FM. Rick is the featured artist for the month of June on the the ART TO-GO digital billboard on I-95 by the Webster Arena (Broad and South Frontage Streets) promoting Bridgeport art, funded and supported by the City of Bridgeport. See video of the digital bill-board launch with Suzanne Kachmar and Mayor Ganim. Rick Shaefer has a selection of paintings, drawings, and limited edition signed prints from now through September at Eleish Van Breems, 22 Railroad Place, Westport. The gallery is hosting a reception on Thurs. June 7, 5-7pm. RSVP requested: evbltd@gmail.com or 203-635-8080. Sat. June 2: Fired Up!, Beechwood Arts Arts Immersion Salon, 8-11pm (Tara Blackwell, Alicia Cobb, Ellen Gordon, Mindy Green, Elizabeth Howard, Karen Kent, Katya Lebrija, Dayan Moore, Sooo-z Mastropietro, Steve Parton, and Diane Pollack). Thurs. 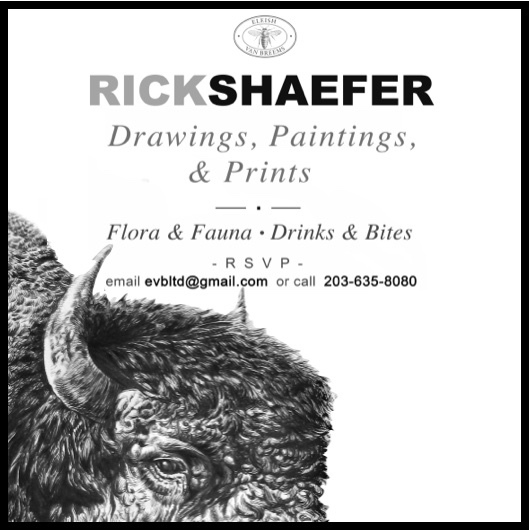 June 7: Rick Shaefer, Drawings, Paintings and Prints, Eleish Van Breems. Artist's Reception, 5-7pm. Thurs. June 7: ARTWorks Gallery, The Delight of Plein Air. Opening Reception, 6-8pm (Elizabeth Hasagawa Agresta, Susan Fehlinger and Lesley Koening). Fri. June 8: Anna Badini, In Other Worlds. Solo exhibition at The Loft Artists Association. Opening reception, 6-9pm. The Somerville Toy Camera Festival seeks entries for its sixth annual celebration of toy and lo-fi photography. Images of any subject matter, made with a “toy” camera – any low-tech camera with no or very limited exposure control, such as pinhole, Holga, Diana/Diana clones, Brownie, Ansco, disposable cameras – are eligible. The key criteria are plastic lenses and a lack of reliable exposure control. Straight Polaroid-type images, or images made with cell phones, digital cameras, or film cameras with full exposure control (such as the Lomo LC series), will not be considered. There is a $25 submission fee per artist with a maximum of 5 pieces accepted. Payment is made through the Nave Gallery (include STCF in the memo. Juror Jennifer Shaw is a fine art photographer who grew up in Milwaukee, Wisconsin and earned a BFA in photography at the Rhode Island School of Design. The Firehouse Center for the Arts in Newburyport MA is now accepting submissions for its 17th Annual New Works Festival. This festival fosters the growth of New England playwrights while showcasing the talent of local and regional actors and directors. Playwrights from across New England are encouraged to submit their 10-minute, one-act, and full-length plays. An independent blind panel will select the festival’s shows in anonymous readings. From the selected plays, one from each category will be awarded The Pestalozzi Prize (for the Full-Length category), with an honorarium of $150.00, and The Peter Honegger Prizes (for the One-Act and Short Play categories) will each be awarded an honorarium of $75.00. Festival dates are January 19 & 20 January 26 & 27, 2018. Submission Details here. Apply here. Watershed Center for the Arts, in Newcastle Maine, offers summer residency sessions organized by artists who propose a theme related to clay and recruit a handful of other artists to join them for two or three weeks. These are called Artists Invite Artists (AIA) Groups. The balance of participants in each AIA session register independently, often drawn by a shared interest in the session theme. Once at Watershed, all artists work side-by-side in the Watershed studios, forming one community. An AIA session provides an opportunity to gather with colleagues you know or to spend time with artists whose work you’ve admired from afar. The lead artist and group of invited artists can collectively shape a creative thematic retreat without the pressure and preparation involved in leading a typical training or workshop. AIA sessions are inspired and guided by the leading artists, but time is spent in shared exploration and dialogue in the studio rather than in formal instruction. 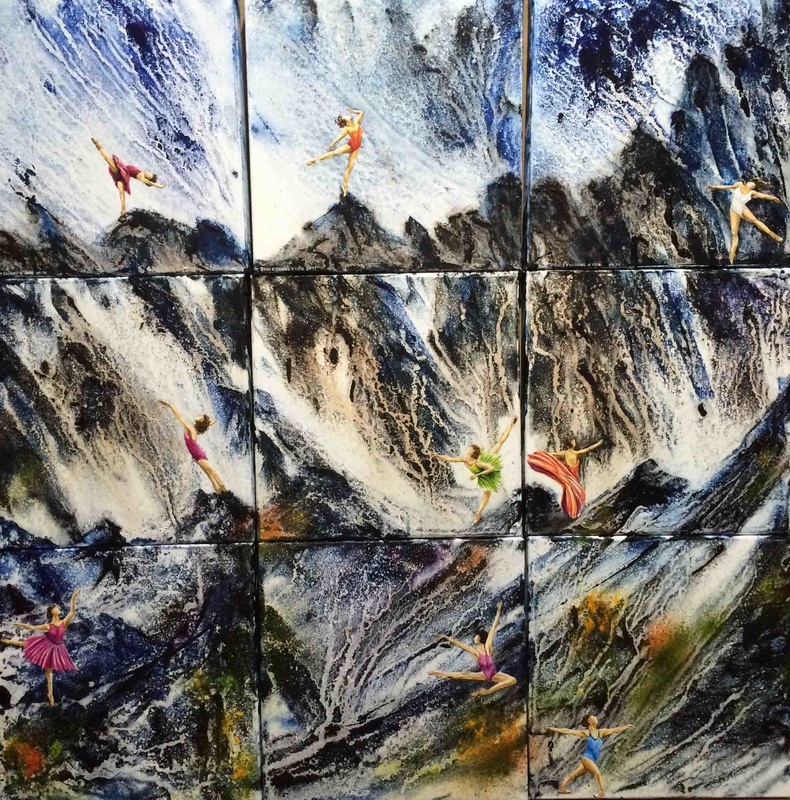 While clay is core to the Watershed experience, some AIA artists work in other media as well. To submit a proposal, develop a session theme and recruit at least four (and up to 8) other artists to participate in the session. As the AIA leader, you attend the residency free of charge and your AIA invited artists receive a 15% discount off their residency fees. Applications to organize a residency are due annually on June 15 in the year prior to the residency. Applicants will be notified in August of their status. For more information on how AIA sessions work, please visit the Watershed website. All mediums considered. Artists working in sculpture and architectural integration are encouraged to apply. Open to all, preference for Connecticut and New England artists. A committee will review the Artist Registry, invite three finalists to create a site-specific proposal and select the finalist. The State of Connecticut Artist Registry will also be consulted for this project, but artists are also strongly encouraged to apply to the City of New Haven's Artist Registry as well. Registering now will also qualify artists for future opportunities. The Artist Fellowship program, run by the CT Office of the Arts, encourages the continuing development of Connecticut artists. The program provides competitive Artistic Excellence grants of $5,000; Artist Fellowship grants of $3,000; and Emerging Recognition grants of $1,000. The funding provides an opportunity for artists to pursue new work and achieve specific creative and career goals. A webinar focused on the FY2019 Arts Fellowship program will take place on Thursday, June 7, 5:30-6:30pm. Register now. Marianna Schaffer, Director of Artist Initiatives with Creative Capital, has written a useful and engaging guide to applying for grants: How to Apply for Grants. The guide features illustrations by Molly Fairhurst and was written for The Creative Independent, an online journal published by Kickstarter. The guide is divided into Doing Your Research, Planning Your Application, What Makes a Good Application, and In Summary. Here is Marianna's introduction: "Applying for a grant is not only a chance to share your work and have it be seen—it’s also a great exercise to put into words what it is that you’re seeking to create. Over the past five years, and in my current role as Director of Artist Initiatives with Creative Capital, I’ve worked with artists and arts organizations to realize many projects and programs across a variety of disciplines and in many different contexts. I’ve also had the pleasure of sitting on panels as an evaluator, and have read countless grant applications in the process. Through these experiences I’ve learned a great deal about the needs of individual artists, and about the distinct ways that artists learn to articulate their practices as they pursue funding opportunities. So, why does this matter? As I see it, every grant is a chance to open up a relationship with a potential funder, curator, or peer—and, you never know who’s sitting on a panel, or what opportunities might arise from your application. I know that the process of writing a grant can be overwhelming, but it’s my hope that the strategies included in this guide can make the experience much more enjoyable and rewarding for everyone involved." The Aldrich Contemporary Art Museum seeks an energetic fundraising professional to join the team as Development Director. Working closely with the Co-Directors and the Development and Marketing teams, the Development Director is a seasoned development professional with a solid understanding of and experience with all fundraising techniques, including major donor solicitation, corporate and foundation grant-seeking, grant writing, government grant development, special events and annual fundraising. The Development Director will be responsible for building and maintaining an active roster of individual donors to the Museum, with a specific focus on upper level patrons and new prospects. The Development Director will also be responsible for identifying, cultivating and stewarding relationships with key institutional and government funders to support fundraising efforts and meet annual fundraising goals. As a frontline fundraiser, the Development Director will be responsible for researching, initiating, implementing, assessing and evolving creative fundraising strategies to maximize donor engagement. The Development Director will take a lead role in cultivating, soliciting and stewarding individual patrons at all levels; overseeing the critical Annual Fund Campaign; acting as a liaison for the Museum’s board of trustees; and partnering with other team members to manage the Museum’s benefit events. S/he will also lead efforts for institutional and government donors, to steward existing funders, expand the roster of funders through active prospecting, and managing the proposal and reporting process. The successful candidate will be an independent thinker with a collaborative spirit, have enthusiasm for and knowledge of contemporary art, and will bring fresh thinking about how to evolve and expand the museum’s donor base at all levels, through online, in print, and in person outreach. S/he will have a demonstrated capacity to build and steward meaningful relationships with donors and work diplomatically with the public and will have the ability to represent the institution in a professional manner. The position requires excellent writing, communications, organizational skills and attention to detail; exemplary follow through; the ability to work both independently and in a team; and a proven track record for thinking creatively and strategically to increase non-profit revenue streams. Full details here. Performing Arts Programs (PAP), the premiere talent development and educational program for children of all skill levels, offers professional, progressive programs to local communities. PAP is dedicated to creating a fun, comfortable and affirming environment to cultivate each child's own unique creativity. PAP seeks experienced Teaching Artists in Broadway Jazz/Musical Theater for programs in Fairfield County. Three weeks in July: one week each in Wilton, Stamford, and Brookfield. Qualifications: Enthusiastic team player who enjoys working with children in the arts. Available Monday -- Friday 8:30am-3:30pm for the full four weeks. Have reliable transportation to drive to the locations. Do not apply if you are out of state. To apply, complete the online application form. Note that summer programs pay a stipend and not an hourly rate. Include resume and three references with email addresses. Must be available for South Windsor training, June 15. Long Wharf Theatre (LWT), an Equal Opportunity Employer, seeks applicants for 2 non-Equity Production Assistants for the 2018-2019 Season. Duties & responsibilities include: assist the Stage Management department with all duties, including a variety of daily rehearsal room responsibilities; sit on book and give line notes; take meeting minutes at all production meetings; help create and maintain production documentation; assist with actor transportation and hospitality; serve as run crew for performances, which might include deck maintenance and wardrobe responsibilities; work on the Mainstage productions as the third member of the Stage Management team, and on the Stage II productions as non-Equity ASMs; provide general assistance in other production departments, and on various rentals and theatre events, as assigned. Qualifications include professional experience as a PA (desired, but not essential); excellent verbal and written communication skills; ability to lift 40lbs; valid driver’s license. For more information, and to apply, click here.